You guys. I’ve been waiting for this day to happen for nearly a year. For the first time in his entire life (read: over one year now) the little man snoozed through his early morning call for milk, meaning I got to start my day before he did. I don’t think I’ve ever been so happy to be awake at 5:30am before. Sure it’s still pitch dark outside but I’m not bleary-eyed from being up in the middle of the night and I don’t feel like I’ve been punched in the face. However fleeting the peace and quiet may be, I’m savoring being snuggled up on the couch in front of the fireplace with my laptop. 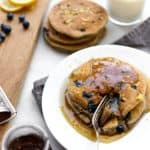 Now, in a perfect scenario, I’d have a stack of these Lemon Blueberry Buckwheat Ricotta Pancakes in front of me and a homemade latte (or mimosa) in hand. Unfortunately, with our espresso machine steaming milk is about as quiet as a plane taking off and it’s far too early to be popping bottles so I’m just gonna pretend. As mamas we must take what we can get, am I right? 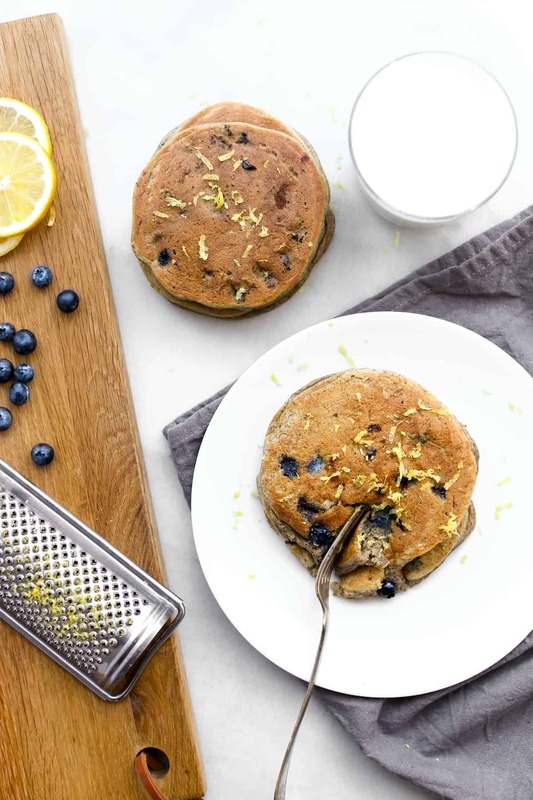 Now back to these brunch-worthy Lemon-Blueberry Buckwheat Ricotta Pancakes. 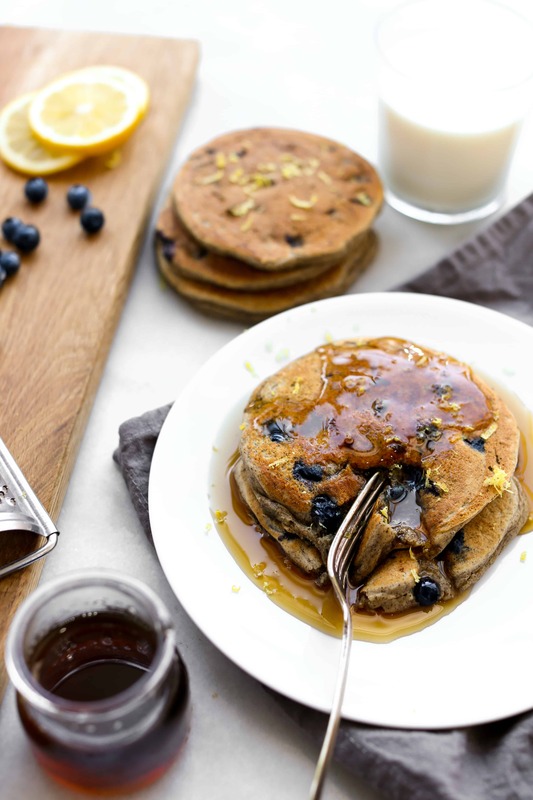 The lemon-blueberry combo offers the perfect amount of tang to be enjoyed straight off the skillet but also balances the sweetness of a hearty drizzle of maple syrup. There’s really no wrong way to eat these pancakes. They’re even toddler-friendly! 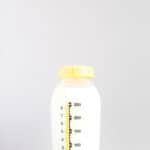 Little Noah loves his with a put of butter and cut into strips with a sippy cup of milk on the side. Made with milk, these little flapjacks also provide important nutrients like protein, calcium and magnesium. Milk is a wholesome, naturally nutritious staple in our refrigerator so I make an effort to mix it into recipes whenever I can. It works especially well breakfast foods like zoats, breakfast quinoa, muffins, scrambled or baked eggs, waffles and, of course, pancakes. 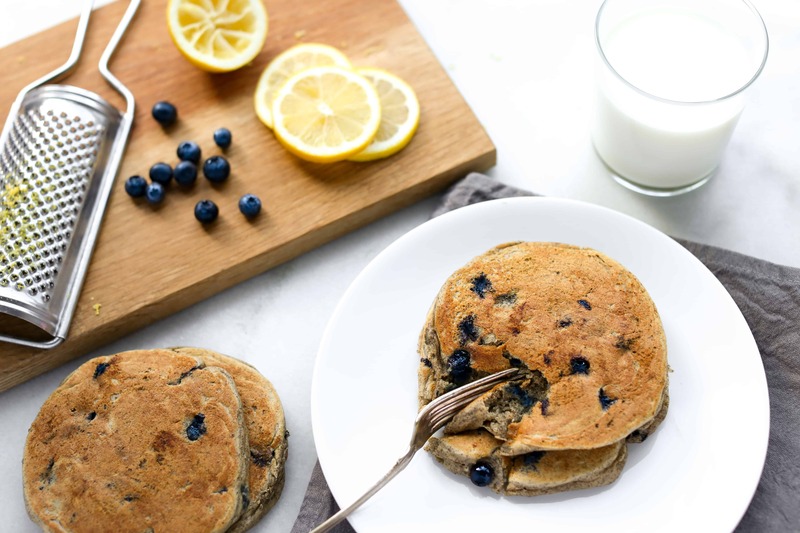 Whether you’re hosting a weekend brunch, or just want to have a delicious, nutrient-dense breakfast your family will love, these babies will do the trick. 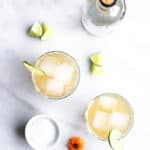 Leftovers also freeze well and defrost quickly for busy weekday mornings — or the rare morning you find yourself with a few minutes to enjoy breakfast and a few sips of coffee in solitude before the kids wake up. Heat a nonstick skillet or griddle pan over medium-low heat. In a large bowl, whisk eggs, sugar, lemon juice, and lemon zest together until frothy, about 30 seconds. Whisk in ricotta cheese and 1 cup milk and let stand for a few minutes. While waiting, combine all-purpose flour, buckwheat flour, baking powder and baking soda in a separate bowl and mix until incorporated. Add flour mixture and blueberries to ricotta-milk mixture and stir until just combined. Lightly grease preheated griddle or nonstick skillet with cooking spray. For each pancake, pour 1/4 cup batter onto hot skillet or griddle and cook until evenly brown, about 2-4 minutes. Flip and cook until evenly golden on the other side. Repeat with remaining batter, greasing skillet or griddle as needed between batches. Top with pure maple syrup, fresh fruit and/or butter, if desired, and serve with an 8-ounce glass of milk. Enjoy! A special thanks to the National Milk Life Campaign for sponsoring this delicious recipe. 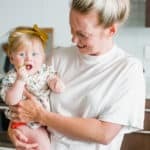 For more nutritious recipes, head on over to MilkLife.com or connect with them on social via Facebook, Twitter, Pinterest and Instagram. Do you think your lemon/blueberry/ricotta pancake recipe would work in a waffle maker? Looks delicious! Do you ever list calories and nutrition information in your recipies? I am trying to be mindful of calories/proteins/carbs and sugar. Thank you! Please ask for an Nespresso Aeroccino for Christmas. It will change your latte life. OH and I love 5 am science… except this AM P was up and READY TO RUN at 5:45am. Yes, we will take what we can get. silence!!! not science, of course.